DUBUQUE, Iowa (CNS) — Sister Helen Maher Garvey, former president of both the Leadership Conference of Women Religious and of her order, the Sisters of Charity of the Blessed Virgin Mary, died Aug. 6. She was 82. Sister Garvey, who entered religious life at age 17 and took the name Sister Robert Joseph, earned a doctorate in organizational development from Columbia University in New York City. She taught elementary school at schools run by her order in Chicago and Antioch, Illinois, and in Fort Dodge, Iowa. She later served as principal of elementary schools in Bellerose and Hempstead, New York, and was then elevated to leadership in the BVM order in 1976. Only 41 at the time of her election, Sister Garvey served 16 years as either president or vice president of the congregation, concluding her tenure as president in 1992. During her tenure as president, the BVMs created the Heartland Housing Initiative in Dubuque, and renovated a stately old home into apartments for 22 families, naming it Helen Garvey Place. In 1993, she began an 11-year ministry as director of pastoral services for the Diocese of Lexington, Kentucky. She developed lay leadership and worked with parish councils in a largely rural and unchurched area. 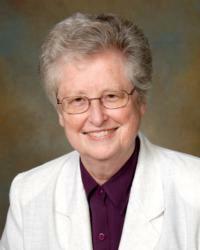 Sister Garvey was elected to the three-year presidency of the LCWR in 1986. In this role, she addressed St. John Paul II on behalf of American women religious when he visited San Francisco in 1987. At its 1986 assembly in Atlanta, Sister Garvey talked about the two-year “marathon” of negotiations to achieve a reconciliation that her community and others went through when the Vatican sought retractions from 24 women religious who had signed a New York Times ad on abortion. The ad, which had appeared during the 1984 presidential campaign, argued that a diversity of opinion exited among American Catholics on the abortion issue. At the LCWR’s 2009 convention, she was a recipient of one of its Outstanding Leadership Awards. Outstanding Leadership Award, its highest honor. At the time of the award, Sister Garvey was project coordinator of LCWR’s traveling museum exhibit, “Women & Spirit: Catholic Sisters in America.” The exhibit traveled to 10 cities coast to coast over a three-year period from the Smithsonian Institution in Washington to Ellis Island, and westward to Dubuque and other cities on the way to the California coast. Sister Garvey was a consultant for the National Religious Retirement Office, assisting religious communities plan for their retirement needs, and worked with many individual religious communities as a meeting facilitator and speaker. She received an honorary degree from Clarke University in Dubuque, and served on the board of trustees at Clarke as well as at Mundelein College and Loyola University in Chicago. She most recently on the Board of the National Catholic Reporter Publishing Co.
Born in Hempstead, New York, Jan. 17, 1935, she entered the BVM congregation Sept. 8, 1952, from St. Martha Parish in Uniondale, New York. She professed first vows in 1955, and final vows in 1960. On Aug. 17, visitation will take place in the motherhouse chapel at Mount Carmel in Dubuque, followed by a prayer service at 11 a.m. A funeral Mass is scheduled for that afternoon, with burial in the Mount Carmel cemetery. Eternal rest grant unto her O Lord and let your perpetual light shine upon Sr Helen.